On Friday, U.S forces transferred the last prisoner they had been holding in Iraq over to Iraqi officials, CNN reports. 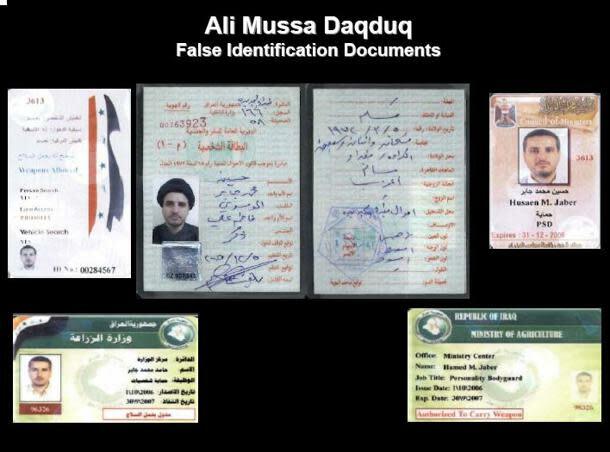 Ali Mussa Daqduq, a senior Lebanese militant suspected of helping plot a 2007 ambush in Karbala that killed five U.S troops, was transferred into Iraqi custody, National Security Council spokesman Tommy Vietor told CNN Friday. "We did so because we felt that was the fastest possible way to bring him to justice," Vietor told CNN's Adam Levine. "We are continuing to discuss this case with the Iraqis." "We take this case very seriously, and for that reason have sought and received assurances that he will be tried for his crimes," Vietor added. "We have worked this at the highest levels of the U.S. and Iraqi governments, and we continue to discuss with the Iraqis the best way to ensure that he faces justice." The United States has previously sought Daqduq's extradition in order to try him before a military commission, LongWarJournal's Bill Roggio reported last May. But ultimately, American military authorities gave up and handed him over to the Iraqis after "it became clear the Iraqis would not be able to" extradite him, Levine wrote. President Obama met with Iraqi Prime Minister Nouri al-Maliki at the White House this week to discuss the future of American-Iraqi relations after the withdrawal of the last U.S. forces from Iraq. Both leaders emphasized Iraq's independence from Iran--but Iraq's Shiite-dominated government has rejected several recent American requests that also drew opposition from Iran as politically untenable. Among the American proposals Iran has rejected were the plan to preserve a small follow-on force in Iraq in the wake of this month's withdrawal plan and the maintenance of a small U.S. training mission in Iraq. Defense Secretary Leon Panetta and Gen. Lloyd Austin--the top U.S. military commander in Iraq--presided over a flag-lowering ceremony Thursday at Baghdad airport to mark the formal end of the U.S. military mission in Iraq. U.S. forces had held Daqduq, a senior commander with the Lebanese Shiite militant group Hezbollah, as an enemy combatant since he was detained in 2007. Daqduq had initially claimed to be deaf, according to several reports--but American intelligence officials "identified him as a 24-year veteran of Hezbollah who had commanded a special operations unit and been sent to Iraq to develop 'special Groups' within Shi'ite militia," CNN's Tim Lister reported last month. Iraqi authorities in 2009 released two militant Iraqi Shiite brothers, Laith and Qais al-Khazali, who also allegedly took part in the highly sophisticated Karbala attack. During that action, gunmen "wearing 'American-looking uniforms' and carrying 'U.S.-type weapons,' drove through checkpoints before opening fire on U.S. soldiers in the Karbala government compound," CNN reported in 2009, citing the U.S. military.The initial ambush killed one U.S. soldier and wounded another who later died; three others who were kidnapped were later killed. A 'cheap hawk': What would Newt Gingrich's foreign policy be?